Fahren Sie auf dieser Halbtages- oder Ganztagestour mit einer kleinen Gruppe mit einem Quad durch Western Curacaos wildes Gelände. Diese All-Terrain-Fahrzeuge (ATVs) eignen sich für erfahrene oder unerfahrene Fahrer und sind leicht zu fahren. Dadurch können Reisende Teile der Insel erreichen, die mit herkömmlichen Straßenfahrzeugen nicht zu erreichen sind. Erleben Sie atemberaubende Aussichten und Fotoaufnahmen und machen Sie einen Zwischenstopp in der Karibik. Wählen Sie bei der Buchung zwischen Halb- und Ganztagestouren. Brilliant tour. absolutely recommend this tour. Eric's ATV staff very experienced and friendly. There were two different length tours on the day we arrived, a shorter length tour of the Eastern coast which I believe was 3hrs in length and ours which took in the Western side of the Island and 5hrs in length. They cater to all levels of experienced / inexperienced riders. 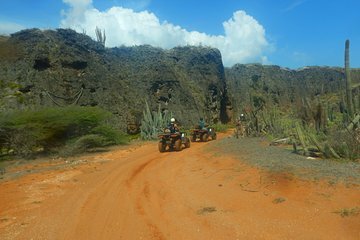 On this trip my husband and I were the only two on our tour and were very experienced in riding ATVs. Our guide was Angelo AKA The Captain, he was a hoot a lot of fun. He catered to our experience as riders, whilst maintained a professional standard, he always checked at regular intervals to see how we were doing to make sure we were keeping up. He Introduced us to local cuisine and drinks which was just what my husband and I were looking for. He shared information of himself and was generally interested in us too. To ride in amongst local traffic and on main roads, taking narrow back streets and then onto the dirt and mud with the fresh air and wind through your hair is just the best feeling. The Captain stopped at places we wanted for photo shots, and catered to our wishes within the confines of the tour time. He was engaging and entertaining. I would strongly recommend this tour for anyone wanting a little freedom from the ordinary, because this is it. Loved it.